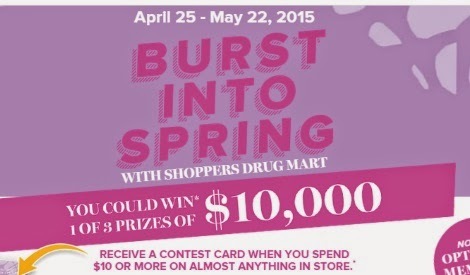 Shoppers Drug Mart has a new Burst Into Spring contest! You could win 1 of 3 prizes of $10,000! Every time you spend $10 or more on almost anything in the store, you will receive a contest card with a PIN code to enter to win! This contest is valid until May 24, 2015 (pin code cards will be given out until May 22 or while quantities last). Yes -Today I spent $100.00 had to ask for a spring contest card and when I gor home and tries to enter it said invalid # or already used. by whom? not me. I've had the same response when trying to enter this contest. Already used is the comment that comes up. If that is true then how do I enter each pin code which is different??? contest is closed now isn't it? Anyone know where the Spring contest winners are posted. We're into the summer contest already. On the back of the contest cards it states that the contest began June 20, 2015 and closes July 19, 2015.